This is the schematics for a PIC USB gamepad that I have built in a steering wheel shell. The code for the firmware was written in PicBasic Pro and it implements a HID USB device with 2 axes and 4 buttons (only 2 buttons connected in the prototype). 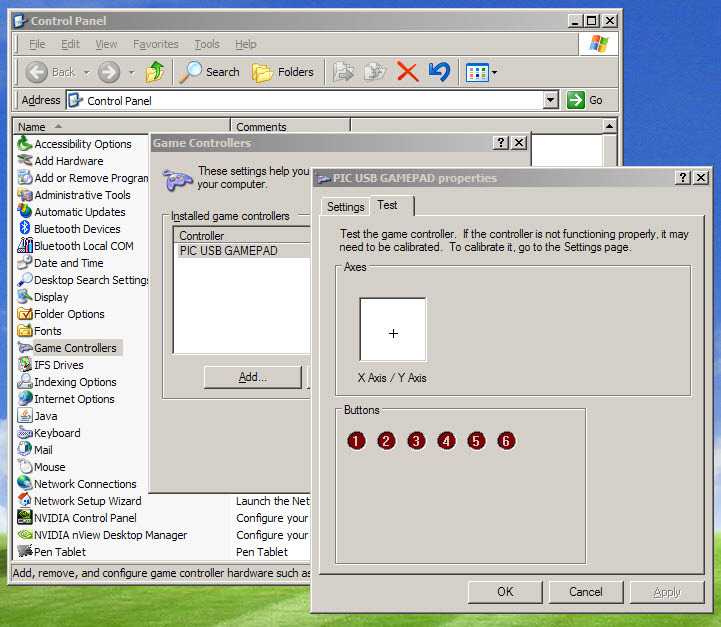 The device is detected by Windows XP/Vista as a standard USB gamepad and can be used with many games and applications. I highly recommend this accelerometer as well as other great Dimension Engineering products, check out their website: www.dimensionengineering.com ! Note: Optionally you can connect 2 more buttons to RB2 and RB3. Below is the PIC Basic code that works both on 18F4550 / 18F2550. (There are other requirements to build USB firmware including the HID header, see compiler documentation). IMPORTANT NOTE: Please disconnect any Microchip Devices (including the PICKit2 programmer) before plugging this device since it's using same HID VENDOR /PRODUCT ID provided in Microchip sample files. If you plug 2 devices with same VENDOR/PRODUCT ID you might get a hardware conflict and the devices might not work. Here is how it is detected by Windows XP. Please note that if you don't change the USB HID Vendor ID and Product ID code this device might conflict with other microchip HID devices using same indentification, including the PICKIT II USB programmer (you can't have them plugged in both at the same time). There's no need to calibrate the device on this Windows screen, since it will output values within 0..255 range for both axis and it will be centered close to 128,128 values (we took care of this in the program). If using an existing USB cable , the wire coding is VDD red, VSS black , D+ green , D- white. Second prototype using PIC18F2550 chip.in a cheap Wii steering wheel shell. (Look for them on EBay they sell for about $1.45). First prototype "THE BRICK" , using PIC18F4550 chip, accelerometer removed. It can work as a motion MOUSE too ! Also for anyone interested in a quick build, with all parts and PCB – gamepad kits with pre-programmed PIC and accelerometer are available for 50 USD @ http://gadgetgangster.com/231 . pode me enviar o arquivo HEX para o PIC18F4550? Yes, does anyone has descriptors for this project, they’re killing me…. Thanks for making this available this is a very cool project. I downloaded you project source and tried to compile it with mplab using pbpw.exe as the compiler but get an error, see below. Any suggestions of what I may be doing wrong ? I forgot to ask, what compiler version are you using ? I think I used picbasic 2.5 pro at the time, I no longer use it and switched to MPLAB with C18, C30. I have a note however here in my files: PICBASIC must be on same drive as where your project files are , for example they have to be both on C: or both on D: Also from what I recall I was using the PICBASIC IDE not MPLAB. ok, I have it working now:-) user error! I had the two inner pins of the usb header round the wrong way ! I have another question,if its ok. Do you know how I could get RB4-RB7 as well as RA3-RA5 and RC0-RC7 to behave in the same way as RB0-RB3. As you can tell I am new to this and appreciate your help. Pete to define additional buttons you just need to make sure the pins are set to to input mode. Thanks for all your help. I have finally got a finished project. I was looking to replicate this. and your project was the closet I could find. I removed the accelerometer component and added 18 buttons to give a total of 20. There were a few hoops I had to jump through. Disabling analogue on AN0 and AN1. Disabling MCLR on pin one to use it as RE3. I also had to mod the board to add a bunch of 4.7K resistors for stability. I basically have what I set out to do. I could not figure out how to only have 20 buttons displayed with the HID config so I have 24, any suggestions, look at the code below for details of my changes. I will put a summary together and post a link here to it as soon as I get the chance. If you’re designing anything USB this is a must-have. “Advanced PIC Microcontroller Projects in C: From USB to RTOS with the PIC 18F Series” is also a good book and covers some USB in very easy to read language. I just wonder if i can make it work under Windows7 somehow? It should work under Windows 7 and many other operating systems , it’s detected as standard USB HID Gamepad so no special drivers are required. 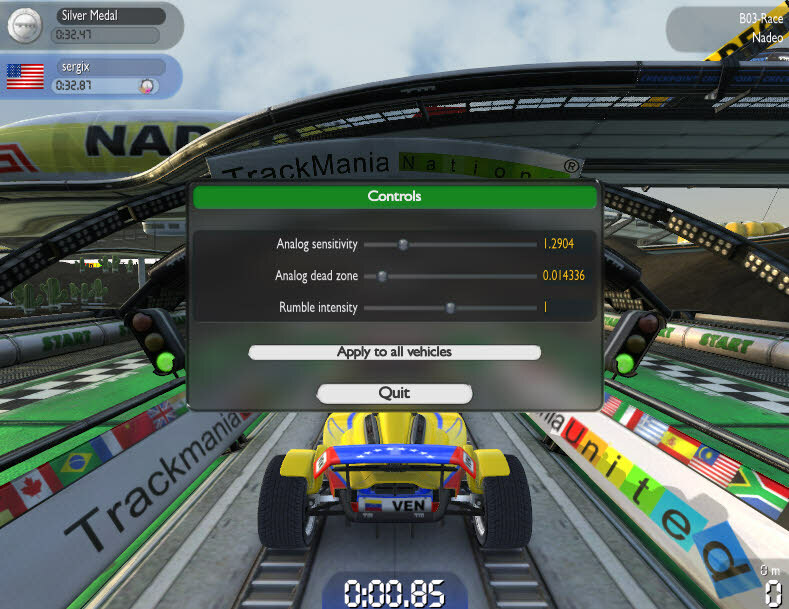 I have build the accelerometer wheel, but i get annoyed when in my Control Panel > Game Controllers the device gets recognized by the name of “PIC USB GAMEPAD”, if someone can show me how and where to change that name into “Drive Wheel” it will be a lot of help. Thank you, and awaiting your responses on my Pic Name problem issue. this string is in USB descriptor in strings sections , if the string length modifies you might have to update some other variables with the new string length, to make it easy you can just pad the remaining space with spaces . nice one . can u please send whole project details ..i would like to try it . The link to your ministore is not working. I would be interested in buying a preprogrammed chip. I’m interested in the mouse code. Is there any way you could include LCD code in it? Hi, What is the design changes I have to do if i build mouse with the PIC 18f4550? how do i configure my pc to use it as a mouse_? which steps may I do for it to be recogniced as a mouse_? thanks in advance! For PicBasic Pro you can use the mouse descriptor provided as sample in USB stack. You don’t need to do anything on PC, once you load the mouse firmware on device it will be detected as a standard HID mouse, no special drivers required. Starlino how do I load the mouse firmware on device ? Hi Starlino. I’m building the gamepad using the 4550. It’s gonna have 8 buttons only (i.e 4 directional,1 select, 1 start, and 2 action buttons) I’m also looking to throw in an LED that lights up when the pad is connected to the host system. Are there any warnings on the physical design of the pad? Also, do I need the external oscillator? I’m trying to build the same thing, but using 10 bit resolution (0 to 1023 steps). I tried messing with the code but with no success. Do you have any tips? Hi.Just want to know,below is my altered HIDDesc.I’m learning about USB & i wanted to make a joystick with throttle,x & y axis & 6 buttons.Unfortunately it’s not working.Can you help me out. ;	retlw	0xc0	;end collection. Great Project. Can you upload HID mouse source code again? It is no longer available at google code. Sage: code is still there, just check, you need a SVN client program to download it. I made the above circuit and uploaded the .hex file (you gave above in the link) in my 18F2550. Everything is done but still when I connect it to my computer(Windows 7), it does not detect any device. Kindly advice. Thank you very much. I downloaded via SVN client. I programmed to 18F2550, and it works fine. How do I invert X direction? I would like to make pointer goes up when I raise the device. Sage you can just flip the mounting of the device or use the configuration utility PC software to invert axis. Sorry I mean invert Y direction (not X). I flip mounted the accelerometer. Very simple, now it is working as I expected. i recenty finished this project… burned the hex file using PICpgm and a serial port programmer, but the device is not working..can u help me wat problem it might hav??? also can u tel me if .47uf capacitor is equivalent to 470nf used here..???? dardard: did you try on a different computer. Also use USB Device View utility ( http://www.nirsoft.net/utils/usb_devices_view.html ) to review/delete inactive USB devices in system cache. They might have same VID/PID and conflict with your device. Sometimes when you have the PICKit programmer plugged in it might interfere with the device. Try changing the VID/PID and see if that helps. Also remove your programmer to see if this is the case. Currently I use C18 compiler from Microchip. I’m building a project where in I’ll mount the accelerometer on an RC car… wherein it acts as an impact sensor that will record the angle of the force and the force and send it to a computer or phone. Can we use MikroC to replace PBP? Hey Starlino, really great work. i want to use it as HID mouse, can you send me complete source code for it. thank you. can you send me complete source code for it. thank you. is there any other codes which have to be loaded into the PIC chip except hex code given on your site for the usb game pad ? plz rply as soon as u can. its urgent. The hex file contains all configurations bits. So it is the only thing that needs to be loaded on the PIC. i tried to implement mouse using pic18f4550. yedhu: check your hardware connections. For beginners to rule out any hardware problems I recommend getting a tested hardware platform such as UsbThumb . Any suggestions as to what might be causing it? I have already linked the missing header and usb configuration files using the Microchip Application Libraries as a reference. I believe when I re-created this project about a year ago, I also had "USB device unknown" when it was plugged in. If memory serves me, I believe the schematic above shows the D+/D- lines reversed…either that or I just reversed them myself by mistake! I build one. Now I want to go further and want to make it wireless to use with my laptop. How can I do that? Please help! what if using ADXL335 sensor, does this work? This place still alive? :) Anyway, I am curious as Rudy already asked, would it work with more modern ADXL335 modules? I guess it would, they also have analog outputs (but 3 axis), maybe I will just order and try. Another question, is there maybe successor to this project somewhere? More axis, more buttons, etc? I know "EdTracker" for axis, but would be interesting in combinations with lots of buttons :) Thanks! Sir can I use GY273 instead of ADXL335? ?